In a food processor, blend together the habaneros, onion, spring onion, garlic, salt, pepper, allspice, cinnamon, nutmeg, brown sugar, chilli, lime, ginger and olive oil. Add the leaves of four sprigs of thyme. Place the marinade in a large bowl with the chicken pieces. Marinate for at least two hours or overnight. Set up your barbecue for direct cooking. Please refer to your handbook for further instructions. Preheat your barbecue for barbecuing. Once the barbecue is preheated, adjust the burner control(s) to medium. Brush both sides of the pineapple with the olive oil and place the pineapple slices directly on the cooking grill. Barbecue for 5 minutes per side. Once cooked, remove from the barbecue to cool. Brush the cooking grills clean. Increase the burner temperature to a medium- high heat. Remove the chicken from the jerk marinade and place the thigh fillets (skin side down first) and the drumsticks directly on the cooking grill. Cook for 16 minutes or until the internal temperature of 74°C is reached, turning the chicken pieces as required. While the chicken is cooking, finish the pineapple salsa. Roughly chop the barbecued pineapple. Toss the pineapple together with the spring onion, lime juice, olive oil and salt. 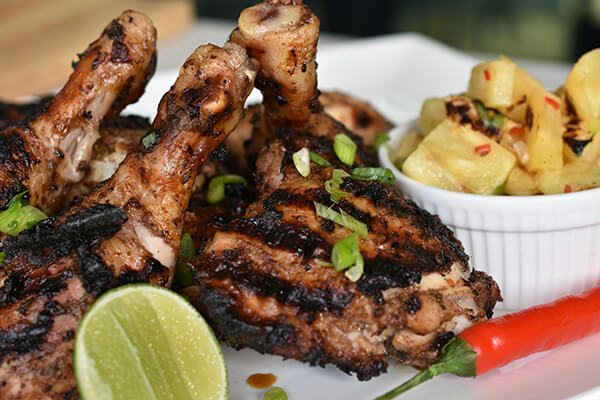 Serve the Jamaican jerk chicken with the pineapple salsa. Marinate the chicken for at least two hours or overnight. Brush the pineapple with a little olive oil to prevent sticking to the grill. Ensure the grills are super clean for the chicken, this will help prevent the chicken sticking to the grill. Cook chicken in a medium to high temperature, to ensure the chicken is cooked through but the lovely charred marks are achieved. Subscribe for all the latest news and promotions.